Purple nutsedge (Cyperus rotundus) is a colony-forming perennial weed that seriously impacts agriculture across the southernmost United States. Native to tropical Eurasia, purple nutsedge has become a major weed of vegetable, row, and plantation crops in tropical and warm temperate climates around the world, is very difficult to manage with either organic or conventional weed control strategies (William, 1976; Bangarwa et al., 2008; Wang et al., 2008), and has been called the world's worst weed (Holm et al., 1991). Purple nutsedge is one of the most extensively researched non-cultivated plant species on the planet, yet the complexities of its life cycle, and its multiple adaptations to environmental extremes and weed control tactics are as yet incompletely understood. Purple nutsedge is a grass-like weed in the sedge family (Cyperaceae) with top growth 4–30 inches tall (Fig. 1), an extensive underground network of basal bulbs, fibrous roots, thin wiry rhizomes (Fig. 2), and tubers borne in chains of 2–6 or more on rhizomes, with tubers spaced 2-10 inches apart. The leaves are mostly basal, dark green, 0.1–0.25 inches wide with a prominent midrib, and abruptly tapered at the tips. The purplish to red-brown inflorescence (Fig. 1) is borne on a culm (stem) that is triangular in cross section and usually taller than the foliage (Bryson and DeFelice, 2009). The inflorescence itself consists of an umbel of spikes, some of which are sessile, and others are borne on stalks of unequal length.The subtending leaflike bracts are usually shorter than the longest spikes. Figure 1. Purple nutsedge in bloom, showing purplish color of flower heads. Photo credit: Forest & Kim Starr, U.S. Geological Survey, Bugwood.org. Figure 2. Several purple nutsedge plants linked by a network of rhizomes. Photo credit: Mark Schonbeck, Virginia Association for Biological Farming. Purple nutsedge initiates its seasonal growth cycle almost entirely from tubers, as viable seeds rarely occur in this species. Tuber dormancy is broken by high temperature (90-100 °F) and diurnal temperature fluctuations. In Hawaii populations, 30 minute daily pulses of 95 °F over a baseline of 68 °F stimulated shoot emergence from tubers as effectively as continuous 95 °F, and an alternating regime of 65 °F and 75 °F resulted in more emergence than constant 75 °F (Miles et al., 1996). This response to temperature fluctuation promotes nutsedge emergence in the absence of a shading canopy. Chilling has been reported to promote tuber sprouting (Shamsi et al., 1978), but tubers are killed by freezing temperatures (Holm et al., 1991). The tuber sprout consists of a sharp pointed rhizome, which grows toward the soil surface, then differentiates into shoot and leaves in response to light (Chase et al., 1998). The plant forms a subterranean basal bulb, which contains the shoot meristem (site of cell division and formation of new leaves). Basal bulbs form mostly within 3 inches of the soil surface, although bulbs have been observed at 4–8 inches (Hauser, 1962; Holm et al., 1991; William, 1976; William and Warren, 1975) (Fig. 3). Bulbs develop fibrous root systems that may extend 4 feet deep in the soil profile (Holm et al., 1991; California Department of Food and Agriculture). Because the shoot growing point remains in the basal bulb, leaves regrow readily if severed at the soil surface (William and Warren, 1975). Figure 3. Most of the basal bulbs in this purple nutsedge stand are within 1.5 inches of the surface, but one bulb can be seen sending up a shoot from a depth of about 4 inches. Photo credit: Mark Schonbeck, Virginia Association for Biological Farming. Within 2–3 weeks after shoot emergence, basal bulbs send out new rhizomes that form additional bulbs and daughter plants (Fig. 4). The cycle repeats several times during a growing season, so that a single sprouting tuber can give rise to hundreds of shoots. In a field trial in the low desert of southeastern California, purple nutsedge planted at a density of about 0.07 tuber per square foot and left uncontrolled increased to about 22 tubers per square foot at the end of one season, and 115 tubers per square foot at the end of the second season (Wang et al., 2008). Figure 4. Young purple nutsedge plants, still attached to their mother tubers by rhizomes ranging from a fraction of an inch (left) to several inches in length (right), depending on the depth of the tuber in the soil. Two of the plants have initiated new rhizomes and daughter plants. Photo credit: Mark Schonbeck, Virginia Association for Biological Farming. Plants usually flower about 7–8 weeks after emergence, although flowering can occur as early as 3 weeks. New tubers begin to form at about the time of flowering. Most tubers are set in the top 8 inches of the soil profile, with a few forming at greater depths. After flowering, purple nutsedge undergoes a marked shift from aboveground to belowground development, so that tubers continue to form for several weeks after shoot growth ceases. In temperate latitudes, this cycle corresponds with the seasons, and tuber formation begins in late summer as photoperiods become shorter (Jordan-Molero and Stoller, 1978). However purple nutsedge populations in Costa Rica and Brazil showed similar developmental cycles (Neeser et al., 1997; William, 1976); a new cycle may be triggered by soil preparation at the beginning of a cropping season (William and Warren, 1975). In a field trial in Georgia, purple nutsedge grown in fertilized soil without competing vegetation flowered and began to form tubers about 7–8 weeks after emergence, and developed 2.4 tons above ground and 4.2 tons below ground dry weight per acre by 12 weeks (Hauser, 1962). After that point, active foliar growth diminished while tuber formation accelerated; by 20 weeks, shoot biomass was 3.3 tons per acre while below ground biomass reached 12 tons per acre. Underground dry weights of approximately 5–8 tons per acre have been observed in naturally occurring heavy infestations at other sites (Holm et al., 1991). For comparison, the above ground biomass of an 8-ft pearl millet or sorghum-sudangrass cover crop with a fully closed canopy is about 5–6 tons per acre. Purple nutsedge has the C4 photosynthetic pathway, which contributes to its ability to grow and spread rapidly in hot weather and high light levels. The weed shows tremendous heat tolerance in field conditions, yet tubers can be killed either by desiccation to 15–24% moisture content in direct sun, or by exposure to 122 °F for 12 hours (Holm et al., 1991; Webster, 2003). However, tubers and bulbs located several inches deep in the soil profile are shielded from lethal temperatures, and the deep, fibrous root system keeps tubers hydrated. When drought, flooding, or other unfavorable conditions occur, foliage dies back and viable dormant tubers remain. Like most C4 plants, purple nutsedge is shade intolerant, and can be suppressed by a closed crop canopy, although tubers remain viable and send up new shoots when the canopy is removed (Holm et al., 1991). In greenhouse trials, neutral shade (white cheesecloth) that reduced incident light by 20% reduced purple nutsedge growth (dry weight accumulation) by 25%, whereas 60% shade cut aboveground dry weight by 80% and tuber dry weight by 97% (Santos et al., 1997b). In a field trial in Brazil, nutsedge compensated for light reductions by shade cloth up to 63% by increasing leaf length and plant height, with no decrease in biomass (William and Warren, 1975). 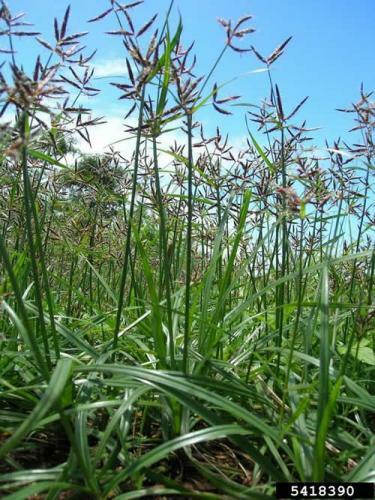 However, a similar degree of shade from crop canopies greatly reduced new tuber production by purple nutsedge during the cropping cycle in Costa Rica (Neeser et al., 1997). Bush snap bean, a bush bean/sweet corn intercrop, and sweet potato competed more effectively than corn alone, pole bean, or bell pepper. In India, native soil endomycorrhizal fungi were found to colonize purple nutsedge, but failed to form the mutually beneficial arbuscular structures in the plant's roots, and significantly reduced nutsedge growth rates (Muthukumar et al., 1997). 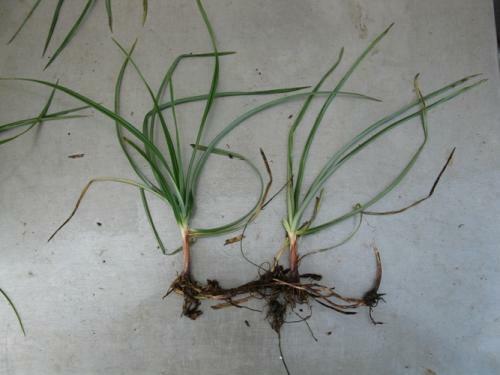 When onion, a “nurse plant” that forms a beneficial symbiosis with the same fungi, was grown with nutsedge, the adverse impacts of mycorrhizae on nutsedge growth were accentuated. Keeping the soil flooded inhibited mycorrhizal development and restored nutsedge growth to that of mycorrhizae-free controls. A few crops may retard purple nutsedge growth through allelopathy. Four foliar applications of a water extract of sorghum (containing water soluble allelochemicals) significantly reduced growth of a weed flora dominated by purple nutsedge, and protected corn yields more economically than either hand weeding or the herbicide pendimethalin (Cheema et al., 2004). In greenhouse studies, sweet potato cv. ‘Regal’ reduced purple nutsedge growth through allelopathy, although the crop was similarly suppressed by the nutsedge (Peterson and Harrison, 1995). In field trials, Neeser et al. (1997) found that sweet potato suppressed purple nutsedge tuber formation to a substantially greater degree than can be attributed to shading alone, and hypothesized that allelopathic effects contributed to the suppression. A 4-ton-per-acre cowpea cover crop, mowed at maturity and left as a mulch, suppressed weed growth (of which purple nutsedge was a major component) by 70–90% during pepper production in the desert of southern California (Hutchinson and McGiffen, 2000). 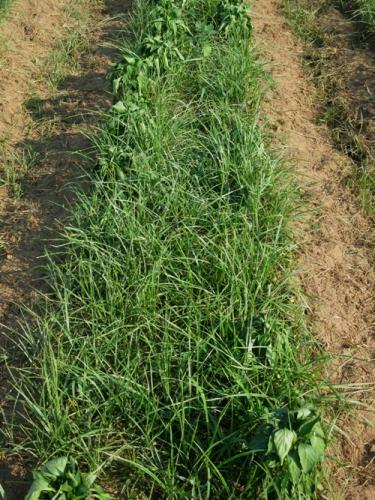 Since nutsedge readily penetrates organic mulch, an allelopathic effect of cowpea on the weed may be involved. On the other hand, incorporation of a turnip cover crop (rich in isothiocyanates, a potent class of allelochemicals in brassicas) failed to affect purple nutsedge growth in South Carolina field trials (Bangarwa et al., 2008). Purple nutsedge competes vigorously against most crops for soil moisture and nutrients (Fig. 5), and against low-growing or slow-starting crops for light. It is especially competitive during warm seasons with ample moisture, and becomes less so in cooler, drier conditions (William and Warren, 1975). Purple nutsedge sometimes occurs with the closely related weed yellow nutsedge; however purple nutsedge is the more aggressive of the two in hot climates (Wang et al., 2008), whereas the reverse is true in cooler conditions (Jordan-Molero and Stoller, 1978). High levels of available nutrients and moisture seem to intensify purple nutsedge competition against crops. Vegetable farmers in Brazil and Panama reduce nutsedge competition by placing fertilizer and water near crop plants rather than applying water and nutrients to the entire field (William, 1976). Increasing fertilizer N rates have accentuated yield losses to purple nutsedge in field trials with radish (Santos et al., 1998), tomato (Morales-Payan et al., 1997) and upland rice (Okafor and De Datta, 1976). Greenhouse trials have suggested a similar pattern in the interaction between purple nutsedge and pepper (Morales-Payan et al., 1998) and cilantro (Morales-Payan et al., 1999), and increased nutsedge competitiveness toward cotton at higher soil moisture levels (Cinco-Castro and McCloskey, 1997). Figure 5. A heavy infestation of nutsedge within crop rows has seriously affected this pepper crop by competing for moisture. Photo credit: Mark Schonbeck, Virginia Association for Biological Farming. Substances released from living or decaying below-ground parts of purple nutsedge have shown allelopathic activity against barley, mustard, and cotton (Friedman and Horowitz, 1971; Horowitz and Friedman, 1971), and sweet potato (Peterson and Harrison, 1995) in greenhouse trials. 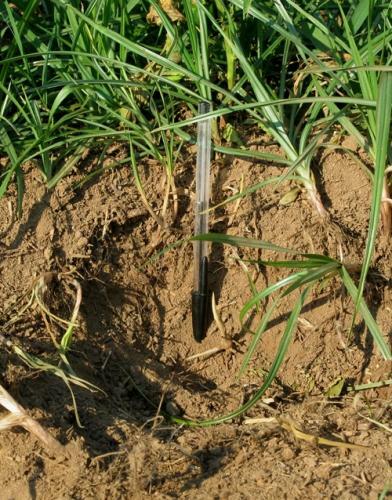 Given the large underground biomass in a heavy purple nutsedge infestation, the possible contribution of allelopathy to this weed's adverse impacts on crops many times its height in field conditions merits further investigation. Purple nutsedge readily penetrates black plastic film mulch (Webster, 2005a) (Fig. 6). Black plastic doubled the rate at which purple nutsedge spread and propagated in field studies in Georgia (Webster, 2005b), probably because the mulch maintained higher soil temperatures. However, clear or translucent plastic film mulches reduce purple nutsedge growth because the emerging shoots open their leaves in response to light before penetrating the film, and become trapped (Patterson, 1998; Chase et al., 1998). Figure 6. Purple nutsedge emerging through black plastic film mulch. Photo credit: Rebekah D. Wallace, Bugwood.org. Mechanical control of an invasive perennial weed infestation begins with an initial vigorous tillage to fragment the weed, followed by additional cultivations whenever fragments have regenerated new shoots with 3–4 leaves, at which time the weed's underground reserves have been drawn down to their lowest point (Mohler and DiTommaso, unpublished). For mechanical control of nutsedge, repeating cultivation every 2–3 weeks, before plants reach the 6-leaf stage (Fig. 7) has been recommended (California Department of Food and Agriculture; Russ and Burgess, 2009). Figure 7. The purple nutsedge regrowth in this photo has about 5–6 leaves per plant, and will begin rebuilding reserves and forming new daughter plants unless it is cultivated immediately. Photo credit: Mark Schonbeck, Virginia Association for Biological Farming. Purple nutsedge is difficult to control through this strategy because of its tremendous underground reserves and because shoot growing points remain below ground in the basal bulb. In South Carolina, the weed has been observed to regenerate substantial shoot growth and begin forming new rhizomes within 2 weeks after tillage (Fig. 8).Experiments with clipping top growth every 2 weeks for 8 months, or every 6 days for 6 weeks weakened but did not kill tubers (Santos et al., 1997a; William, 1976). In field trials cultivation every 2–3 weeks for 2 years has reduced tuber populations by 80% (Holm et al., 1991). However, such intensive cultivation degrades soil quality, and may not be practical. Thus, cultivation must be used in conjunction with other tactics for effective nutsedge control. Figure 8. (a) Purple nutsedge regrowth just 13 days after field in the South Carolina piedmont was rototilled to a depth of 4 inches, bedded, and planted to sweet potato. Alleys were tilled again a few days prior to the photograph. (b) Individual plants forming new rhizomes 13 days after tillage. Photo credits: Mark Schonbeck, Virginia Association for Biological Farming. In the humid parts of the southern U.S., soil solarization—heating the soil by covering with clear or translucent film during hot sunny weather—does not produce lethal temperatures deep enough in the soil profile to eradicate nutsedge tubers (Webster, 2003), and may even stimulate tuber sprouting and shoot emergence (Egley, 1983). However, sprouting tubers are weakened when the emerging foliage is trapped and heat-killed under the film. Substantial reduction of purple nutsedge infestations has been achieved in field trials in northern Florida, especially under a thermal-infrared-retentive (TIR) plastic film that gives more intense heating than clear polyethylene (Chase et al., 1999). In the Coachella Valley (low desert region) of southeastern California, where average daily maximum temperatures in July exceed 104 °F, solarization with black plastic during a summer fallow period generated temperatures lethal to nutsedge tubers to a depth of 6 inches (Wang et al., 2008) This treatement virtually eliminated purple nutsedge in a subsequent fall broccoli crop. In the same trial, repeated manual cultivation reduced tuber populations by 93%, yet nutsedge competition still slashed broccoli yield 80%. A summer smother crop of sudangrass proved ineffective in reducing nutsedge populations. Poultry and hogs consume nutsedge tubers, and have shown potential for purple nutsedge control. Early experiments in Alabama with running laying hens in fields with purple nutsedge infestations of about 20 tubers per square foot showed that a stocking rate of 480 birds per acre maintained for one full growing season eradicated the weed (Mayton et al., 1945). However, since chickens forage mostly within 50 feet of the henhouse, enclosing 300 chickens in a single 0.5-acre pen was not effective in cleaning the whole area. Chickens used for this purpose should be one of the more actively-foraging breeds, and must be acclimiatized to grazing. Mayton et al. (1945) also found that weeder geese at 4 to 16 birds per 0.5-acre could clean purple nutsedge out of a cotton field, but geese were less effective in cleaning up a fallow field. Tillage to break up tuber chains (thus breaking dormancy) enhanced efficacy of nutsedge eradication by geese. In India, pigs are sometimes used to remove purple nutsedge from rice paddies before planting the crop. Pigs readily root up and consume the tubers, and running 60-75 animals in a 2.5 acre (1 hectare) field for one day has been reported to provide effective control (OSWALD, 1997). On USDA-certified organic farms, livestock and poultry must be removed from the field and their droppings incorporated into the soil at least 120 days before harvest of an organic food crop that may come into contact with soil or soil particles, or 90 days for a crop not so exposed, such as tree fruit or sweet corn. Efforts to develop integrated organic management strategies for purple nutsedge have thus far been only partially successful. In Clemson, South Carolina, March–July fallow treatments of solarization with clear or green translucent film, a turnip cover crop followed by solarization, or tillage every 3 weeks were followed by hand weeding, straw mulching, or no weed control during fall pepper production. Two successive years of fallow treatments followed by hand weeding reduced purple nutsedge tuber populations by 36–58%, whereas straw mulch was less effective, and tuber populations increased substantially without weed control during pepper production (Bangarwa et al., 2008). The authors concluded: “when selecting a site for organic crop production, an effort should be made to select one free of purple nutsedge”. In Gainesville, Florida, researchers and farmers are testing a rotation of fall vegetables (lettuce or broccoli), spring vegetables (pepper or squash), and summer fallow with repeated tillage, repeated flaming, cover crop, or solarization. Treatments reduced purple nutsedge populations by approximately half during the first year, but little further reduction occurred during the second year, when high summer rainfall favored the weed (Koenig and Chase, 2010). Highly competitive cover or cash crops such as jack bean, velvet bean, soybean, cotton, and chayote, have been used with some success against purple nutsedge in Brazil and other tropical regions (William, 1976). Competitive vegetable crops, including bush bean, cucumber, and transplanted cabbage may require only one hand weeding 3–5 weeks after planting (critical weed-free period) to prevent yield loss to purple nutsedge (William and Warren, 1975). Bush snap bean and sweet potato grown without any post-emergence weed control almost stopped tuber propagation during the cropping cycle in Costa Rica (Neeser et al., 1997). Break tuber dormancy by physically breaking up tuber chains and providing thermal stimuli for germination. Disrupt emerging new growth, exhaust tuber reserves, and prevent propagation through timely cultivation. If practical, cultivate deep enough to sever basal bulbs from root systems and mother tubers. Provide strong crop competition, with crop canopies generating at least 80% shade during critical times for nutsedge suppression, such as during tuber set in late summer. Manage nutrients and moisture to favor the crop over the nutsedge; avoid overwatering and overfertilizing. Additional tactics may include soil solarization in very hot sunny climates; weed removal by hogs,poultry, or geese; shifting crop planting and harvest dates to avoid the most intense nutsedge competition; encouraging soil mycorrhizal fungi; and growing crops known to be allelopathic to nutsedge. Bangarwa, S. K., J. K. Norsworthy, P. Jha, and M. Malik. 2008. Purple nutsedge (Cyperus rotundus) management in an organic production system. Weed Science 56: 606–613. (Available online at: http://dx.doi.org/10.1614/WS-07-187.1) (verified 10 Sept 2012). Bryson, C. T., and M. S. DeFelice. 2009. Weeds of the South. University of Georgia Press, Athens, GA.
California Department of Food and Agriculture. Weed Information – Yellow Nutsedge and Purple Nutsedge. (Available online at: http://www.cdfa.ca.gov/plant/ipc/weedinfo/cyperus.htm) (verified 10 Sept 2012). Chase, C. A., T. R. Sinclair, D. G. Shilling, J. P. Gilreath, and S. J. Locascio. 1998. Light effects on rhizome morphogenesis in nutsedges (Cyperus spp): Implications for control by soil solarization. Weed Science 46: 575–580. (Available online at: http://www.jstor.org/stable/4045964) (verified 10 Sept 2012). Chase, C. A., T. R. Sinclair, and S. J. Locascio. 1999. Effects of soil temperature and tuber depth on Cyperus spp. control. Weed Science 47: 467–472. (Available online at: http://www.jstor.org/stable/4046223) (verified 10 Sept 2012). Cheema, Z. A., A. Khaliq, and S. Saeed. 2004. Weed control in maize (Zea mays L.) through sorghum allelopathy. Journal of Sustainable Agriculture 23: 73–87. (Available online at: http://dx.doi.org/10.1300/J064v23n04_07) (verified 10 Sept 2012). Cinco-Castro, R., and W. B. McCloskey. 1997. Purple nutsedge (Cyperus rotundus L) competition with cotton under wet and dry soil moistures. Weed Science Society of America Abstracts 37: 55. Egley, G. H. 1983. 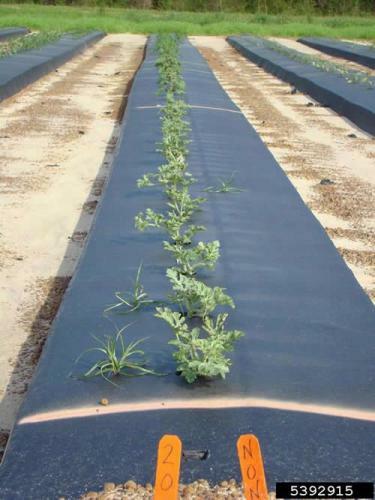 Weed seed and seedling reductions by soil solarization with transparent polyethylene sheets. Weed Science 31: 404–409. ((Available online at: http://www.jstor.org/stable/4043730) (verified 10 Sept 2012). Friedman, T., and M. Horowitz. 1971. Biologically active substances in subterranean parts of purple nutsedge. Weed Science 19: 398–401. (Available online at: http://www.jstor.org/stable/4041790) (verified 10 Sept 2012). Hauser, E. W. 1962. 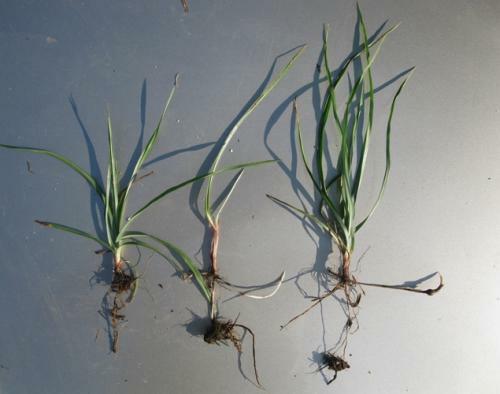 Development of purple nutsedge under field conditions. Weeds 10: 315–321. (Available online at: http://www.jstor.org/stable/4040836) (verified 10 Sept 2012). Holm, L. G., D. L. Plucknett, J. V. Pancho, and J. P. Herberger, 1991. The world's worst weeds. Kriegar Publishing Company, Malabar, FL. Horowitz, M., and T. Friedman. 1971. Biological activity of subterranean residues of Cynodon dactylon L., Sorghum halapense L., and Cyperus rotundus L. Weed Research 11: 88–93. (Available online at: http://dx.doi.org/10.1111/j.1365-3180.1971.tb00982.x) (verified 10 Sept 2012). Hutchinson, C. M., and M. E. McGiffen, Jr. 2000. Cowpea cover crop mulch for weed control in desert pepper production. HortScience 35: 196–198. (Available online at: http://hortsci.ashspublications.org/content/35/2/196.abstract) (verified 10 Sept 2012). Jordan-Molero, J. E., and E. W. Stoller. 1978. Seasonal development of yellow and purple nutsedges (Cyperus esculentus and C. rotundus) in Illinois. Weed Science 26: 614–618. (Available online at: http://www.jstor.org/stable/4042940) (verified 10 Sept 2012). Kawabata, O., and R. K. Nishimoto. 2003. Temperature and rhizome chain effect on sprouting of purple nutsedge (Cyperus rotundus) ecotypes. Weed Science 51: 348–355. (Available online at: http://dx.doi.org/10.1614/0043-1745(2003)051[0348:TARCEO]2.0.CO;2) (verified 10 Sept 2012). Koening, R., and C. A. Chase. 2010. Weed management techniques that really work. Presentation at the Southern Sustainable Agriculture Working Group Conference in Chattanooga, TN, January 22–23, 2010. Findings to be published in refereed journal. Mayton, E. L., E. V. Smith, and D. King. 1945. Nutgrass eradication studies IV: use of chickens and geese in the control of nutgrass, Cyperus rotundus L. Journal of the American Society of Agronomy 37: 785–791. Miles, J. E., R. K. Nishimoto, and O. Kawabata. 1996. Diurnally alternating temperatures stimulate sprouting of purple nutsedge (Cyperus rotundus) tubers. Weed Science 44: 122–125. (Available online at: http://www.jstor.org/stable/4045792) (verified 10 Sept 2012). Mohler, C. A., and A. DiTommaso. Unpublished. Manage weeds on your farm: A guide to ecological strategies. Department of Crop and Soil Sciences, Cornell University. Pre-publication draft, version 5.1 (2008). Publication through SARE expected in 2012. Morales-Payan, J. P., B. M. Santos, W. M. Stall, and T. A. Bewick. 1998. Interference of purple nutsedge (Cyperus rotundus) population densities on bell pepper (Capsicum annuum) yield as influenced by nitrogen. Weed Technology 12: 230–234. (Available online at: http://www.jstor.org/stable/3988380) (verified 10 Sept 2012). Morales-Payan, J. P., B. M. Santos, W. M. Stall, and T. A. Bewick. 1999. Influence of nitrogen fertilization on the competitive interactions of cilantro (Coriandrum sativum) and purple nutsedge (Cyperus rotundus L.). Journal of Herbs, Spices and Medicinal Plants 6: 59–66. (Available online at: http://www.tandfonline.com/doi/abs/10.1300/J044v06n04_07#) (verified 10 Sept 2012). Morales-Payan, W. M. Stall, D. G. Shilling, J. A. Dusky, and T. A. Bewick. 1997. Influence of nitrogen on the interference of purple and yellow nutsedge (Cyperus rotundus and Cyperus esculentus) with tomato (Lycopersicon esculentum). HortScience 32: 431. (Available online at: http://hortsci.ashspublications.org/content/32/3/431.3.abstract) (verified 10 Sept 2012). Muthukumar, T., K. Udaiyan, A. Karthikeyan, and S. Manian. 1997. Influence of native endomycorrhiza, soil flooding and nurse plant on mycorrhizal status and growth of purple nutsedge (Cyperus rotundus L.). Agriculture, Ecosystems and Environment 61: 51–58. (Available online at: http://dx.doi.org/10.1016/S0167-8809(96)01073-0) (verified 10 Sept 2012). Neeser, C., R. Aguero, and C. J. Swanton. 1997. Incident photosynthetically active radiation as a basis for integrated management of purple nutsedge (Cyperus rotundus). Weed Science 45: 777–783. (Available online at: http://www.jstor.org/stable/4045844) (verified 10 Sept 2012). Okafor, L. I., and S. K. De Datta. 1976. Competition between upland rice and purple nutsedge for nitrogen, moisture, and light. Weed Science 24: 43–46. (Available online at: http://www.jstor.org/stable/4042494) (verified 10 Sept 2012). Patterson, D. T. 1998. Suppression of purple nutsedge (Cyperus rotundus) with polyethylene film mulch. Weed Technology 12: 275–280. (Available online at: http://www.jstor.org/stable/3988388) (verified 10 Sept 2012). Peterson, J. K., and H. F. Harrison. 1995. Sweet potato allelopathic substance inhibits growth of purple nutsedge. Weed Technology 9: 277–280. (Available online at: http://www.jstor.org/stable/3987745) (verified 10 Sept 2012). Russ, K., and C. Burgess. 2009. Nutsedge. Clemson University Extension. 5 pp. (Available online at: http://www.clemson.edu/extension/hgic/pests/weeds/hgic2312.html) (verified 10 Sept 2012). Santos, B. M., J. P. Morales-Payan, W. M. Stall, and T. A. Bewick. 1997a. Influence of tuber size and shoot removal on purple nutsedge (Cyperus rotundus) regrowth. Weed Science 45: 681–683. (Available online at: http://www.jstor.org/stable/4045894) (verified 10 Sept 2012). Santos, B. M., J. P. Morales-Payan, W. M. Stall, T. A. Bewick, and D. G. Shilling. 1997b. Effects of shading on the growth of nutsedges (Cyperus spp.). Weed Science 45: 670–673. (Available online at: http://www.jstor.org/stable/4045892) (verified 10 Sept 2012). Santos, B. M., J. P. Morales-Payan, W. M. Stall, and T. A. Bewick. 1998. Influence of purple nutsedge (Cyperus rotundus) density and nitrogen rate on radish (Raphanus sativus) yield. Weed Science 46: 661–664. (Available online at: http://www.jstor.org/stable/4045916) (verified 10 Sept 2012). Shamsi, S. R. A., F. A. Al-ali, and S. M. Hussain. 1978. Temperature and light requirements for the sprouting of chilled and unchilled tubers of the purple nutsedge, Cyperus rotundus. Physiologia Plantarum 44: 193–196. (Available online at: http://dx.doi.org/10.1111/j.1399-3054.1978.tb08617.x) (verified 10 Sept 2012). Wang, G., M. E. McGiffen, Jr., and E. J. Ogbuchiekwe. 2008. Crop rotation effects on Cyperus rotundus and C. esculentus population dynamics in southern California vegetable production. Weed Research 48: 420–428. (Available online at: http://dx.doi.org/10.1111/j.1365-3180.2008.00649.x) (verified 10 Sept 2012). Webster, T. M. 2003. High temperatures and durations of exposure reduce nutsedge (Cyperus spp.) tuber viability. Weed Science 51: 1010–1015. (Available online at: http://dx.doi.org/10.1614/WS-03-018R) (verified 10 Sept 2012). Webster, T. M. 2005a. Mulch type affects growth and tuber production of yellow nutsedge (Cyperus esculentus) and purple nutsedge (Cyperus rotundus). Weed Science 53: 834–838. (Available online at: http://dx.doi.org/10.1614/WS-05-029R.1) (verified 10 Sept 2012). Webster, T. M. 2005b. Patch expansion of purple nutsedge (Cyperus rotundus) and yellow nutsedge (Cyperus exculentus) with and without polyethylene mulch. Weed Science 53: 839–845. (Available online at: http://dx.doi.org/10.1614/WS-05-045R.1) (verified 10 Sept 2012). William, R. D. 1976. Purple nutsedge: Tropical scourge. HortScience 11: 357–364. William, R. D., and G. F. Warren. 1975. Competition between purple nutsedge and vegetables. Weed Science 23: 317–323. (Available online at: http://www.jstor.org/stable/4042570) (verified 10 Sept 2012).